In real estate, no clients equals no sales. So where do top producing agents get their business or produce their leads? The number one referral source for agents is their sphere of influence and their network of individuals they’ve built over the years. 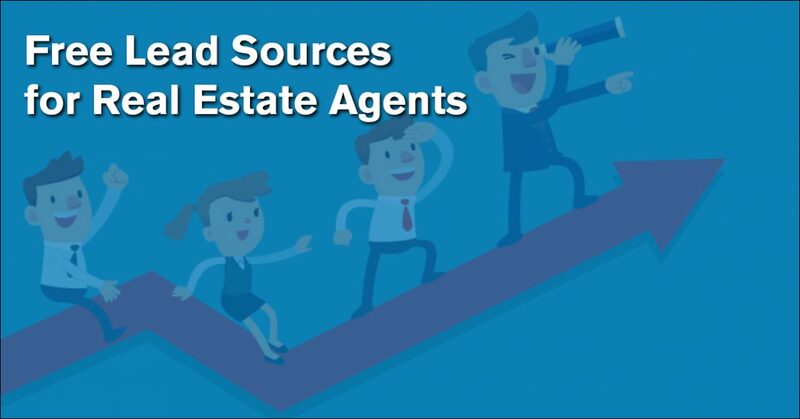 Lead generation sources like these take time and persistence to build and if you’re a new agent finding business can be tough. If you have the financial backing, there are many paid lead generation sources that can help you grow your business. Real estate has become way more technologically literate over the years and big software companies are starting to pop up. These companies offer a full suite of lead generation and marketing for agents that is plug-and-play. However, the cost of doing so can add up quickly and while you’re getting your business up and running this time spent spending without earning can eat into your savings or marketing budget leaving you with less money than you had when you started. Don’t get it wrong though – these paid lead generation sources can pay off big time once they get going, they can just be costly and for newer agents without the financial support that is needed these campaigns can feel out of reach. So what are some good lead generation sources for agents looking to grow their business without costing to much money? Everyone you know and their extended family should know what that you are now working in real estate. As mentioned earlier, the best source for new business is your direct network. A simple phone call to your phone contact list, regardless of home ownership or not, is a great idea. If the people you know don’t know that you are an active Realtor they’ll not think to refer their friends or family. You never know when you’ll get a call from the individual you spoke to a year earlier and they are now looking or a new home. Another great idea for keeping in touch with your sphere of influence is by sending notes or letters around the holidays. As an agent your business is all about how you market yourself so don’t be afraid to reach out to friends and friends of friends. No, we’re not referring to hanging out at the farmers market and ‘farming’ for business. Instead, social networks and websites, like Facebook, offer a local marketplace where individuals can buy and sell property. Next time you login to Facebook go ahead and check out the marketplace tab to the left. Posting ads here about your services can help you connect with individuals who are on the hunt for a new home and you can stumble upon FSBO listings that you could inquire about. Even if you’re doing apartment locating, Facebook marketplace is full of people looking for new apartments and can have your inbox pinging throughout the day with new leads. Normally we’d list Craigslist here, but with the rise in online scams and fraud have made Craigslist a tough source to spend your time farming. Another option in dealing with Facebook are groups on the site. Facebook groups have turned into these large communities full of people either a part of a specific group or looking for a certain item – one being real estate. When you get a chance sometime search Facebook for groups that relate to real estate in your market – you might be surprised by what you find. Another great networking tool are meetups. This free website is full of groups that support just about every hobby/event under the sun. Whether you’re a big fan of board games or you’re looking for referrals for your business, meetup.com provide a great opportunity for Realtors to connect with those around your communities with similar hobbies or interests. Make some new friends and possible some future clients while you’re at it! Imagine a place where the majority of the foot traffic you see are potential buyers who are actively looking in your market – we just described open houses! If you take a look at your local MLS, you’ll probably notice there are thousands of listings with listing agents eager to get their listings sold for their clients. Even if you don’t have your own listings to host open houses for don’t be afraid to reach out to agents in your market and offer to host open houses for their listings. While some are protective of their listings and won’t allow you to do so there are plenty of agents who would be happy to let you host an open house for their listing as it’s more exposure for them and their listing. Search your local MLS for home that you like and contact the agent – you never know what is going to happen! Open houses are one of the best lead generation sources for new real estate business! There are plenty of websites out there that offer home owners an avenue to place their home for sale without using a Realtor, but as you know the MLS is the #1 tool for selling a home. These FSBO sites don’t get anywhere near the internet traffic that a listing on the MLS would receive and this can make selling a home much quicker and more competitive. Keep an eye on these sites and note properties that have been listed by an owner for sometime without selling. These sellers may be motivated enough to sell their home now that they might utilize your services as an agent. Even when out riding around in your car you might see homes with a For Sale By Owner sign in the yard. Jot down the phone number and keep tabs on that property. After some time if it’s still sitting there don’t be afraid to contact the owner and offer your services. You never know what will happen! With the rise in social media, you should be active on every single platform as an agent. Facebook, Twitter, Instagram, Google+ – there is no shortage of online avenues full of potential clients. Continually update your pages with statistics about your market and use the appropriate hashtags to be easily discoverable. With the growth of video marketing, you should be hosting online webinars or real estate talks via facebook live. The beauty is that any time you go live anyone who likes your page or is a friend of yours will instantly get pinged that you went live! Do your research and share it with your market via social media! Consider these ideas to produce free leads for your business and help accelerate your real estate career. As you go about doing these things be sure to keep in contact with your sphere as it grows and your business should grow organically as time goes by. Real estate requires persistence so don’t give up in slow times! If you’re looking to grow your business through paid means consider taking advantage of Zen Commissions’ industry-leading commission advance rates.